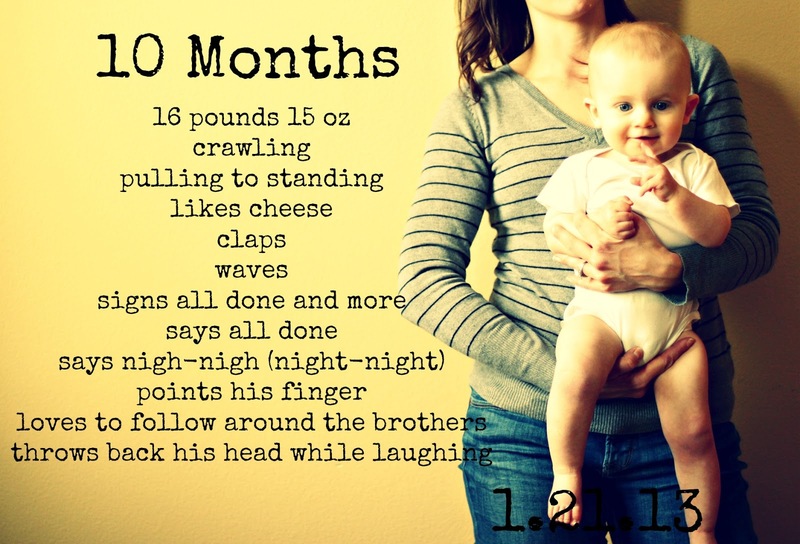 We are now in February, but right around the end of January our sweetest ever little Bean hit the 10 month mark. Almost over night he went from pretty containable to all over the place. I spend my day following him around or searching for him and watching the trouble he has currently gotten into. I just listen for the springy sound of the door stops. I am on constant floor patrol. The gate is up on the stairs and the older boys are just as vigilant at keeping it up. Bean is a very protected and taken care of...well unless Little feels like tackling him or taking his pacifier away. Middle feels quite accomplished that he can pick him up and carry him around. One of my favorite things is how he waves. He doesn't just open and close his hand or wave it back and forth. He lifts up his whole arm with his cute little palm in the air, like he is just giving you a little, "Hey, how is is going?" It might be the cutest thing ever. He isn't much bigger in size, but he is more coordinated and is starting to look "bigger" aka, older. He continues to be the sweetest baby and a complete joy. He may not sleep consistently at night, but during the day he is delightful. I can't believe he is almost 1. Time really does fly. We just love him so stinkin' much. Oh my heck, he is talking?????!! Wow that is insane! Also, my T has blown him out of the water in the weight category haha at a wopping 17.14 pounds! Hahaha Bean is so small! But soooo cute!! I know right? He just hasn't seemed to get his growth spurt...hopefully soon! Sheesh 10 months wow! Time is just flying!! What a great way to track his growth!! Very cute and a great alternative to a baby book.